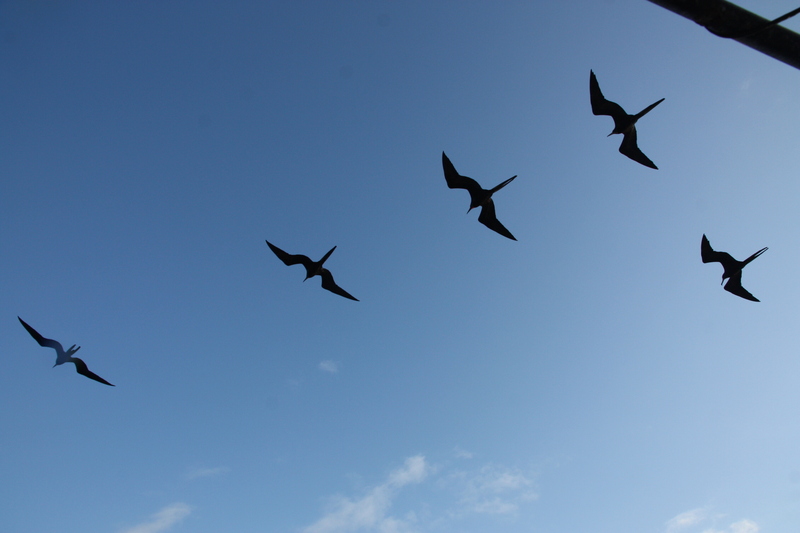 Frigatebirds—powerhouses of the Galapagos | Where to next? 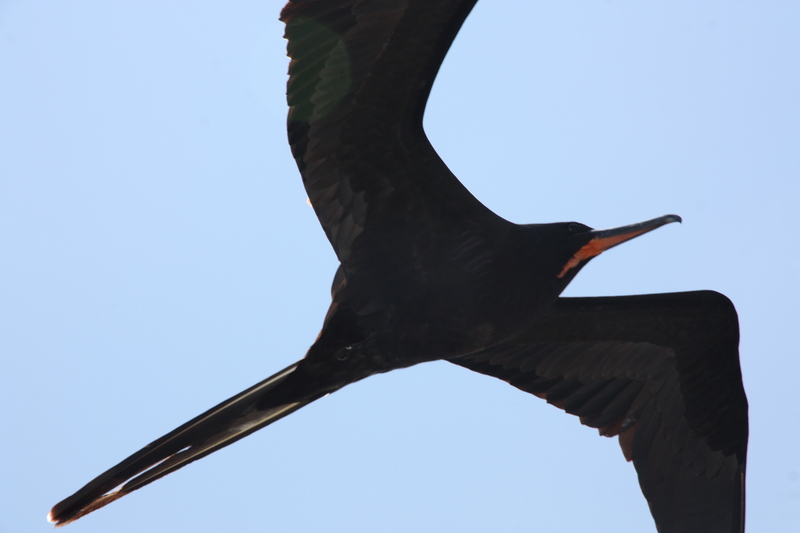 A frigatebird cruises alongside our boat. I’ll be introducing lots of birds from the Galapagos, but I’ll start with the one I found most unusual. Not because it’s beautiful or colourful or clever, but because it’s the most powerful feathered flier I have ever encountered. This large bird, with iridescent black feathers, cruises the skies of tropical oceans almost non-stop. 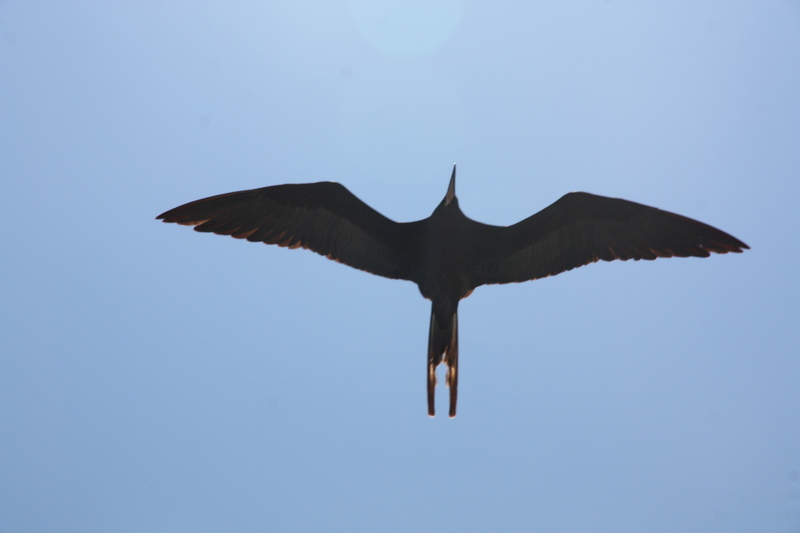 With the largest wingspan to body weight ratio of any bird, they can stay aloft for more than a week. Sometimes they ride weather fronts and signal a change in weather patterns. Frigatebirds have their own problems though. They produce so little of the oil needed to keep their wings dry that they can’t swim or land on water. They’re clumsy walkers too and can’t take off from a flat surface. When they do land, it has to be on trees or cliffs. They eat on the fly, literally, snatching food from the ocean’s surface or sometimes harassing other birds until they drop their catches. This may be why their other names are Man of War and Pirate Bird. Frigatebirds lay one egg per breeding season, and then spend almost a year raising the offspring. It’s the longest parental role in the bird kingdom. The Galapagos Islands have two kinds of frigatebirds—Magnificent and Great. They are hard to tell apart when flying. We think we saw both, but can’t be sure. Officials reckon there are about 4000 pairs of frigatebirds in the archipelago. Every day, up to six birds ‘escorted’ our boat on its travels. We chugged along while they hardly ever flapped their wings—just rode the drafts. I never saw them catch or steal food, and never saw them land.